Brown gyurls gat ah WOMAN mural in town! On a chilly, rainy Saturday afternoon on Dec. 1, 2018, Coolitude Collective and the Indo-Caribbean Alliance brought men, women, and children of all ages to leave their imprint on the youth Indo-Caribbean art movement through empowering brushstrokes. 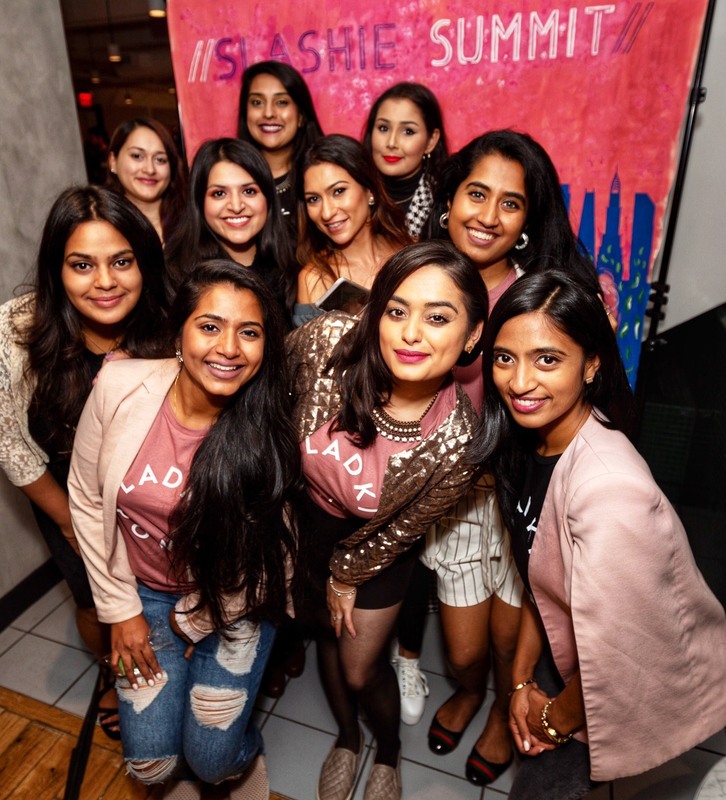 Walking into the basement of the Indo-Caribbean Alliance (ICA) on Liberty Avenue in Richmond Hill, the scent of fresh doubles awashed attendees, soca tunes blared from speakers and dozens of happy voices intermingled in the room. 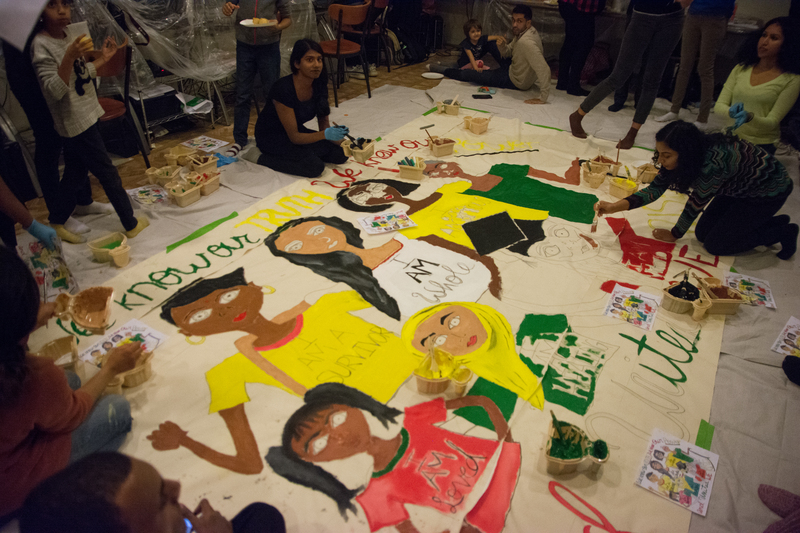 Participants wielded paintbrushes dripping in browns, reds, yellows, and blues, as the faces sketched on the yards-long women’s empowerment mural lying beneath them came to life. 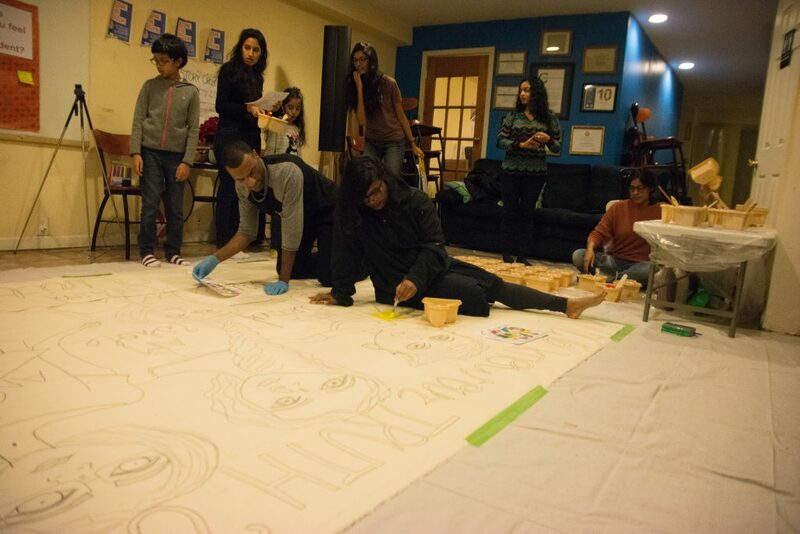 Seema Choudhary, the president and founder of Coolitude Collective, an organization which aims to unite the Indo-Caribbean community through visual arts, brainstormed the idea of a women’s empowerment community mural to uplift women and serve as a reminder of the power they possess. 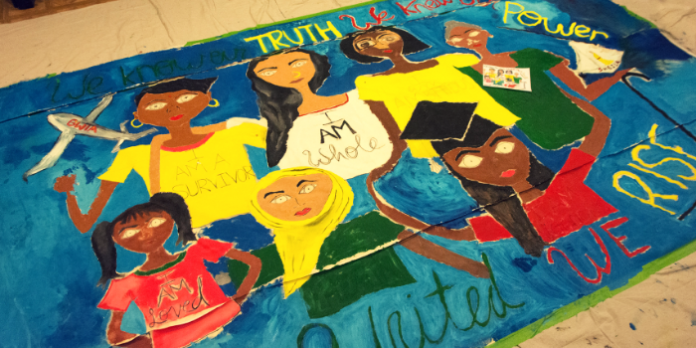 The mural depicts a diverse collection of women of varying skin tones wearing T-shirts emblazoned “I am…” followed by self-affirming words including resilient, ambitious and loved. The process of bringing this vision to life began in 2017 when Choudhary pitched the sketch she concocted during a mural design session. Afterwards, board members from the Indo-Caribbean Alliance and the Jahajee Sisters, two Indo-Caribbean grassroots organizations operating in the Indo-Caribbean community in New York City, joined together to figure out the minute details of creating a mural that could appeal to the hearts, minds, and souls of the women in the community. Once everyone agreed that they wanted the women to represent a wide spectrum of skin tones, ages, hairstyles, and facial features, the team deliberated quotes to be placed on the mural. “We decided as a group on the quote: ‘We know our truth, we know our power, and united we rise,’” Choudhary said. The organizing team also incorporated colors from Surinam, Trinidad and Guyana’s flags in order to make the messages more inclusive. Indo-Caribbean Alliance Board Member Jessica Chu-A-Kong felt connected to the project as a first generation American and the daughter of Guyanese immigrants. ‘I find it even more crucial to bring awareness around [women’s empowerment] to our patriarchal culture,’ Chu-A-Kong said. The Indo-Caribbean community has seen multiple domestic violence incidents over the past decade, several of which resulted in victims losing their lives. On January 1, 2018, in the first recorded murder in New York City, Stacy Singh, a 26-year-old mother of two, was found unconscious by NYPD officers in her home. Her 46-year-old husband, Vishwanand Loknath Singh fatally stabbed her in the torso multiple times, then hung himself from a tree in nearby Forest Park. Stacy’s murder serves as a reminder to the Indo-Caribbean community, to ensure that women and girls are valued, and offered the resources they need if they are suffering from mental, emotional and/or physical trauma. 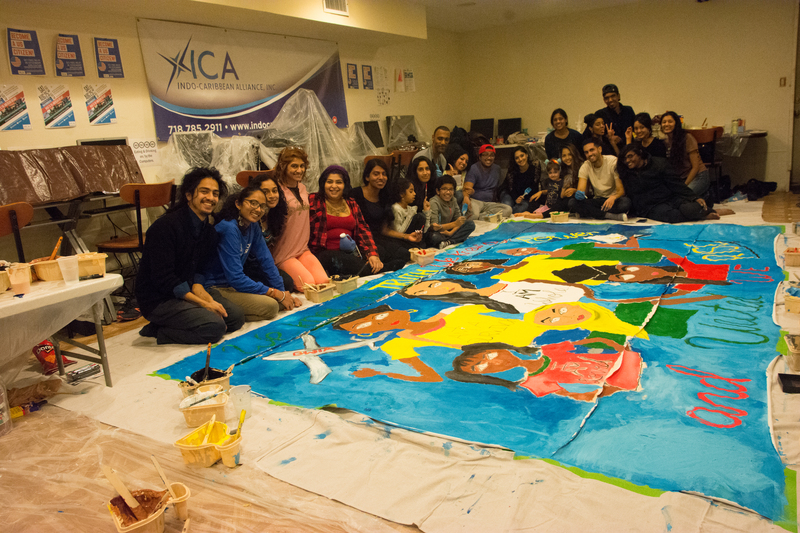 Fatima Shabbir, a mother of four who brought her two eldest children to participate in the community mural, was excited to attend an event co-sponsored by ICA. 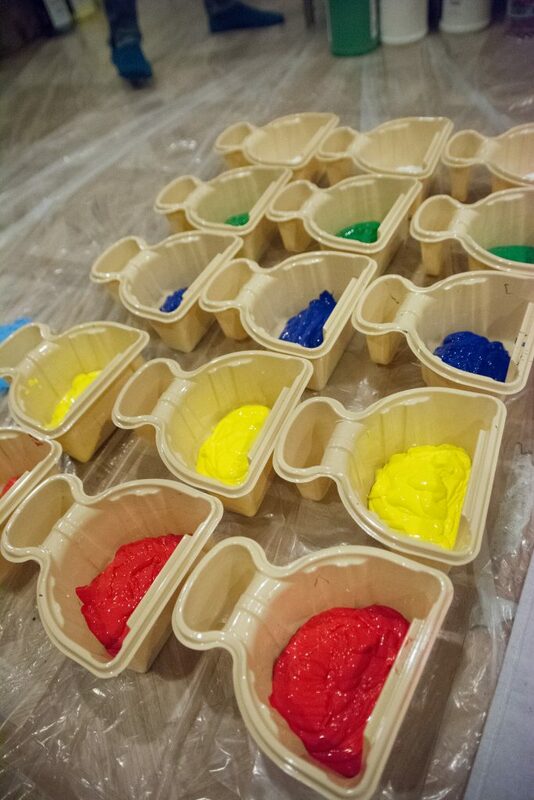 Her children had never participated in a large-scale community event, she recalled them saying that they felt very independent and useful because adults made them feel welcomed and ensured they were an integral part of the painting process. Murals are usually stationary works of art, boldly coloring outdoor spaces and indoor galleries, but Coolitude Collective’s women’s empowerment mural will be traveling — much like how our ancestors crossed bountiful waters when migrating from the Indian subcontinent to the palm trees and blue waters of the Caribbean. This mobile vision of empowerment will be relocated to various locations and events within New York City. The mission behind this concept is to transform the mural into an accessible message which will be able to reach people of all backgrounds, ethnicities, races, and ages, to spread a symbolic representation of female energy, vitality and courage.